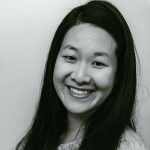 Published Aug 17, 2017 By Julia 1 CommentThis post may contain affiliate links. 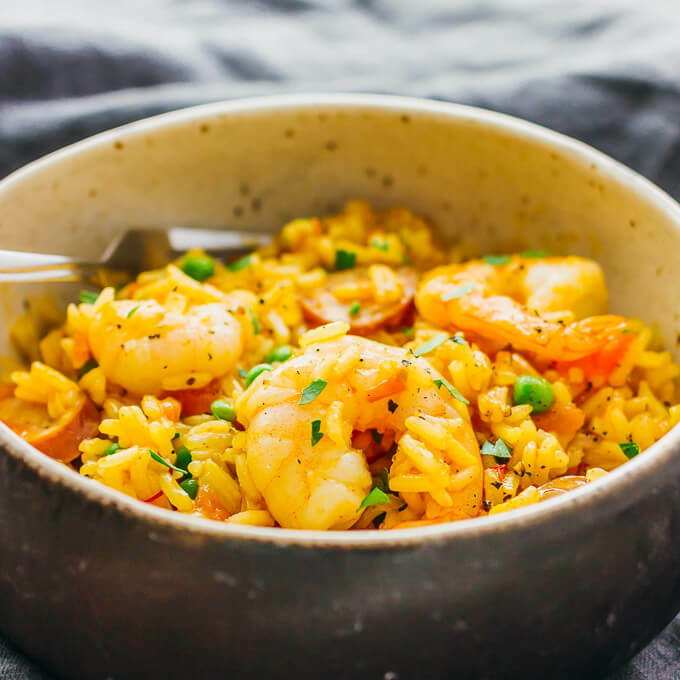 This is my everyday paella: an easy one pot meal with shrimp and smoked sausage. I love one pot dinners that are well-balanced in terms of protein, vegetables, and grains. Dishes such as my one pot chicken and rice and Southwest beef and rice skillet are weeknight dinner staples. 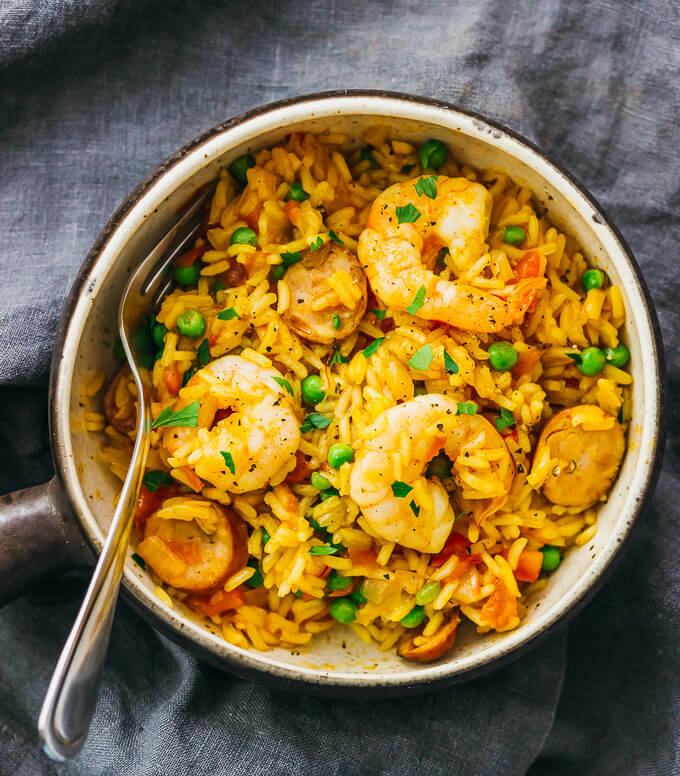 That’s why I’ve been making this Spanish inspired paella for years now — it has sauteed shrimp and smoked chicken sausage, with veggies including onions, peas, and tomatoes. It’s a straightforward and simple recipe without frills, and you only need to use one pan to cook everything including the rice. 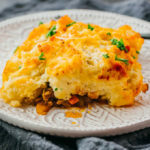 The recipe yields five hearty servings so you can easily feed a family or have guests over for dinner. 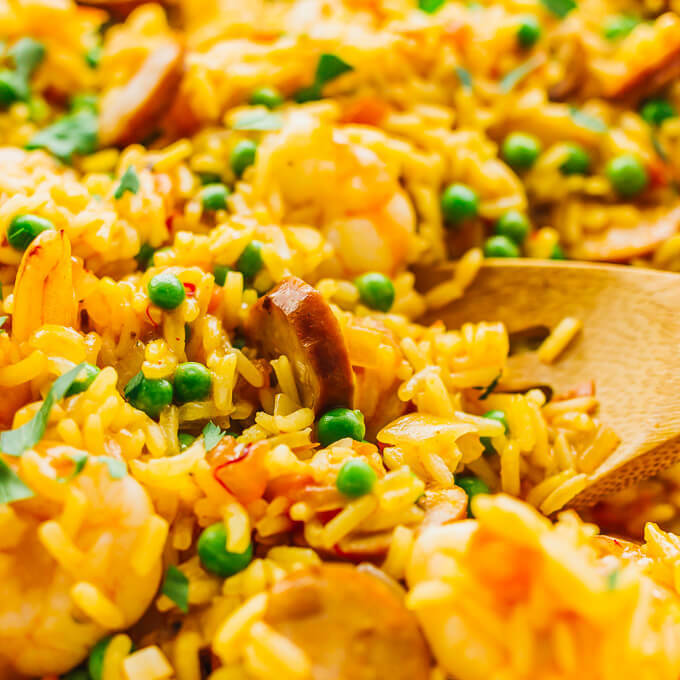 This shrimp paella recipe is actually one of the earliest recipes that I published on the blog. I later took it down as I was planning on reworking the recipe and taking updated photos. Since then, I’ve gotten email requests from readers asking where the recipe went, so I’m happy to say that it’s back on my site now. 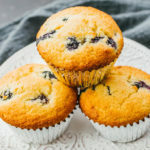 The photos are updated and the recipe has been rewritten to make it clearer along with some minor modifications. I hope you all love this paella skillet, and leave a comment letting me know what you think. Meat substitutions in this recipe are easy to make since they’re cooked separately from everything else. If you don’t like shrimp, you can use some other seafood like scallops, and if you don’t like sausage, you can substitute with chicken chunks. 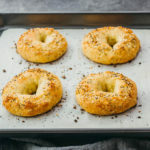 Just be sure to saute them first, cooking until tender or to your preference, transfer to a plate, and stir them back in at the end of the recipe. The only item in the ingredients list that will be harder to find is saffron. Saffron is a spice made using the stigmas and styles (“threads”) from a particular flower, and it’s one of the costliest food ingredients in terms of price per weight. I buy Spanish saffron at Trader Joe’s, where they sell a tiny affordable jar of it in their spice section. I always use saffron when making paella, but seeing as how you’re unlikely to use it for anything else, you can skip it if you’re unable to find it locally. Saffron gives a distinctive yellow color to foods, so if you decide to omit it, your paella will not have the same color, aroma, and flavor. Leftovers reheat well in the microwave, so don’t be afraid to make this recipe even if you’re only cooking for yourself or for two. Make sure you have a large enough pan to hold all of the ingredients — I use a 5 quart pan, and anything 4 quarts or larger will be sufficient. 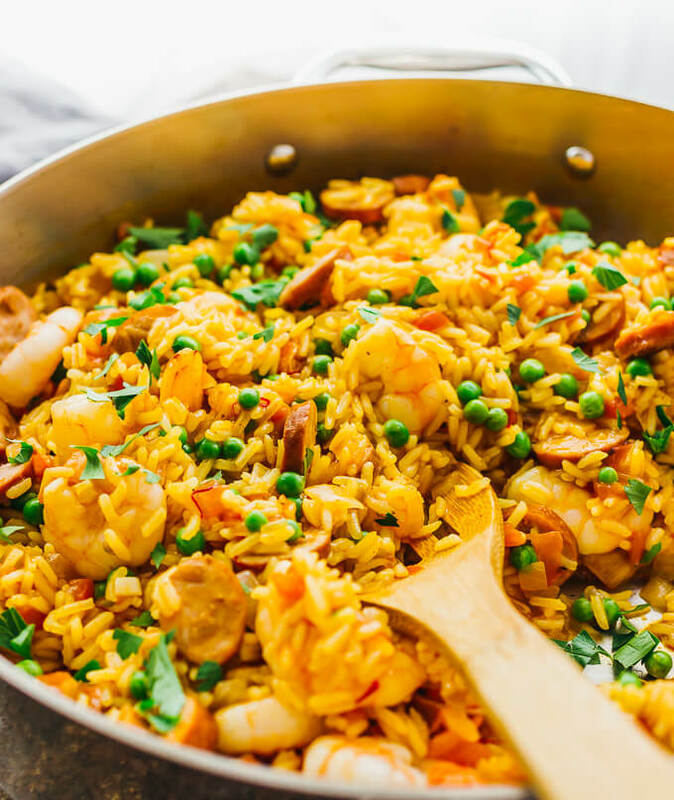 Everyday paella -- an easy one pot meal with shrimp, smoked sausage, tomatoes, onions, peas, garlic, and saffron. Heat 2 tablespoons of olive oil in a 4 quart or larger pan over medium heat for a few minutes until hot. Add shrimp to the pan, sauteing until cooked through, about 5 minutes, turning them occasionally. Transfer the shrimp to a plate. Add sausage rounds to the pan, sauteing until slightly brown, about 5 minutes, stirring occasionally. Transfer to the same plate holding the shrimp. Add chopped tomatoes, onions, and garlic to the pan. Pour 1/4 cup olive oil on top. Cook until the vegetables are soft, about 10 minutes, stirring occasionally. Sprinkle paprika and salt over the pan, and then add in 1/2 cup water. Increase heat to medium-high and cook for 5 minutes to thicken the mixture, stirring frequently. Add rice, saffron, and 4 cups of water to the pan. Cook for 5 minutes, stirring frequently. If your pan can't hold that much liquid, add the water in increments as the liquid evaporates. Reduce to low heat. Let simmer until the rice is fully cooked and the liquid has been absorbed, about 20 minutes, stirring occasionally. Stir in peas, sausage, and shrimp, and heat for a few minutes until warmed through. Add additional salt to taste if needed. So delicious and flavorful! 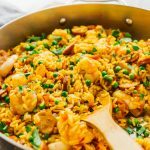 My favorite paella recipe.